Ptl. Kelsey Hedrick who has taken on the role of Historian for the Police Department for his assistance. Among the material he gave us was this email by the late Glenn Waight, former editor of the Review. While three pages of the eleven page email is missing we are able to use what does exist of the email. The date of the email is August 30, 2003. There was little change in the incidence of crime and vice in East Liverpool during this period. A few new offenses such as betting on illegal numbers and professional sporting events grew to be a problem for local officials. During the 1920s enforcement of the national prohibition law kept officers and special agents busy. The proliferation of the automobile led to new crimes such as automobile theft and gasoline station robberies. The Standard Oil station at the corner of Jefferson and West Eighth Streets was robbed by "armed bandits in a Ford roadster" in November of 1927. This marked the fourth robbery within two months. An automobile was placed in service by the police department in May of 1914. During the succeeding seven months, 1,086 persons were transported in the motor patrol car. The chief of police believed that the automobile allowed the force to capture perpetrators that otherwise might have escaped and to answer alarms received from outlying sections of the city. By 1921 offenses related to the automobile were on the rise. In that year there were eighty arrests for reckless driving, twenty-six for driving while intoxicated, and twenty-nine for violating local traffic ordinances. In January of 1922 the police chief recommended the purchase of a motorcycle and a "light" automobile to answer calls more quickly. He also stated that the duties of patrolmen were greatly increased on Saturdays with the influx of an estimated ten thousand out-of-town shoppers and visitors. With East Liverpool on the Lincoln Highway, he added, the traffic situation was also becoming a burden. Police protection in the city also suffered as municipal tax revenue dwindled and the crime rate of previous decades continued. 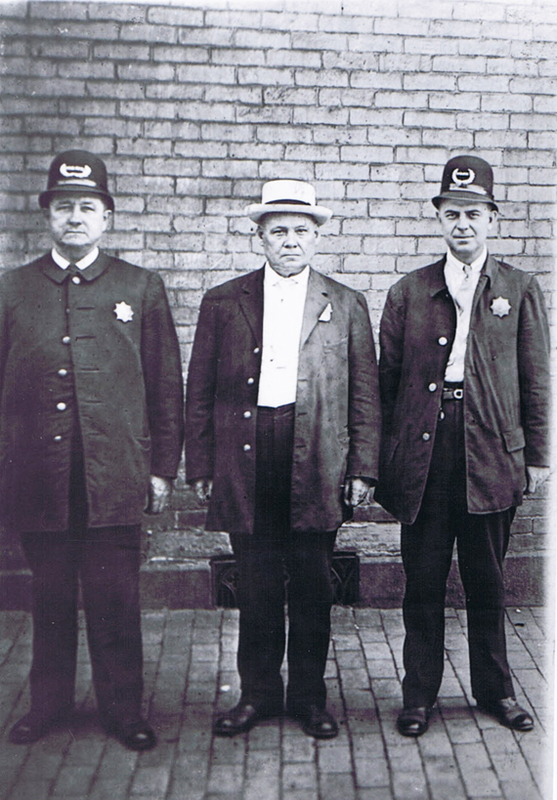 By 1939 the East Liverpool police force consisted of only nine men. When a new police cruiser for the east end was needed in 1938 it was made possible only when the East End Civic League sought contributions and donated half of the cost. In 1943 the police department appealed to city council for two-way radio equipment. At the time East Liverpool was the only city in the Ohio Valley without radio communication. The size of the police department also varied, quite naturally, with the city's revenue . . With one exception, crime in East Liverpool between 1950 and the present was probably typical of other cities of its size. In 1953 police arrested six teenagers for a series of burglaries. The group, termed the "city's first juvenile gang" by the Review, carried long-bladed knives and an improvised blackjack. During the 1950s gambling was a significant problem in the city. In 1954 the Atlas News "bookie joint" on Broadway and the American Pool Room, among others, were raided and closed. Two years later a Grand Jury investigation of gambling in East Liverpool was launched. The Grand Jury determined that for years "open and extensive" gambling was known of by police and the mayor and conducted with their consent, that there were no police records concerning gambling for 1954 - 1955, that the same gambling establishments exist that were reported in 1945, and that the police department failed to confiscate gambling equipment from clubs ordered closed by the Grand Jury. The Grand Jury recommended that civic groups and residents demand law enforcement, that the mayor be held responsible for law enforcement, that all gambling equipment be confiscated and destroyed, that all violations be punished, that the morale of the police department be improved, and that a complete reorganization of the police department take place. In the meantime a number of indictments were handed down by the Grand Jury. When two defendants were convicted in May of 1956 their attorney, Jason Brookes, said there were "twenty or twenty-five other gambling places in the city" and cited the "cloak of protection" which existed. A police department reorganization of sorts took place soon after the gambling	indictments, but not until a second scandal erupted. In March of 1956 news of a police department burglary ring broke in the local press. Five East Liverpool policemen and a special officer with the force were arrested and suspended from the police force for a series of burglaries dating back to 1952. In addition to the indictments, the Grand Jury found the East Liverpool police force to be "inefficient," "untrained," and "incapable of law enforcement." The police chief was judged "wholly incapable of administering his duties." Two other officers were classified as unfit for duty, and one, because of drunkenness and gambling, was dismissed from the force. A wholesale shakeup ensued and a number of officers resigned. Several of the accused were convicted on a number of counts and sentenced to jail terms. Several officers were acquitted but resigned from the police force. In addition, one former policeman was convicted of attempting to bribe a juror. [Hills and Kilns, pages 383-384. In 1956 a Grand Jury investigation into the city problem reported the gambling sites and operators were known to the Mayor and the police with their consent . The probe noted lack of police records of gambling arrests for 1954-55, that the existing establishments were the same listed ten years ago, and police had ignored Grand Jury orders to seize gambling equipment. The Grand Jury urged that civic groups demand law enforcement, that the Mayor be responsible for enforcement, that all gaming equipment be >confiscated and destroyed, violators punished and that the police >department be reorganized. The panel also issued several gambling indictments. But when in May 1956 two defendants were convicted, their attorney Jason Brookes claimed there were 20 or 25 other gambling places in the city, " and referred to "the cloak of protection which exists." Early in March 1956 rumors began drifting out of City Hall of a major criminal investigation of the police department. The first public notice came on Monday March 12 when Dallas E. Bishop of Globe St., a private security officer, was arrested and taken to the County Jail charged with receiving stolen goods. Deputy Sheriff Russell VanFossan said Bishop had sold to a fellow worker at Crucible Steel Co. a shotgun taken Nov. 1 from a Calcutta home. The weapon, Van-Fossan said, had been stolen by George Bontempt, then >residing with Bishop. Bontempt, 22, had been returned from Mississippi for violating a five-year probation after his conviction with a group of other men for robberies at Lisbon and Wellsville. Bontempt had apparently disclosed Bishop, s connection under questioning by law officers. Bishop, working as a special patrolman at the Veterans Social Club in the East End, had been employed by the city three years before . The following day (Tuesday, March 13) Patrolman Robert McBane, a veteran of nearly ten years on the force, was stripped of his badge and jailed after admitting a series of business burglaries over a three-year period. AFTER ALMOST SIX hours of questioning in Mayor Arnold Devon's office, McBane signed a written statement which tied other officers to the crimes. Safety-Service Director William C. Heasley, heading the city investigation, said a tip obtained five weeks previously had opened the probe in the McBane case. The link came when Bishop admitted burglarizing McBane's cabin on the Y. & O. Rd. between Glenmoor and Rock Camp. The loot included two sets of dishes and an electric saw. Further study revealed the dishes and saw had been stolen in other >burglaries. Statements from McBane and Bishop pointed to other officers. >Under questioning by City Solicitor Joseph Cooper, McBane said a police cruiser had been used in at least one burglary. McBane,s list of enterings and thefts included:a series at the Parsons Coal Co.; two at the Burbick Hardware Co.; a series at the Smith & Phillips Co. store; one at the Herman Lumber Co. yard; at least one at the J. C. Penney Co. and one at the Duguesne Distributing Co. The probe into incrimination of other officers culminated more than a week later (Wednesday March 21) in Municipal Judge George Brokaw's court when two former officers and two patrolmen were bound over the the Grand Jury on burglary charges . Robert Carroll and Louis Stuttler, former officers, and officers Robert Hanna and Ira "Nig" Cunningham had been charged the day before by Police Chief John Russell. Nearly 100 gathered in Municipal Court to watch the five-minute arraignments , with every seat filled and the rest standing around the walls. 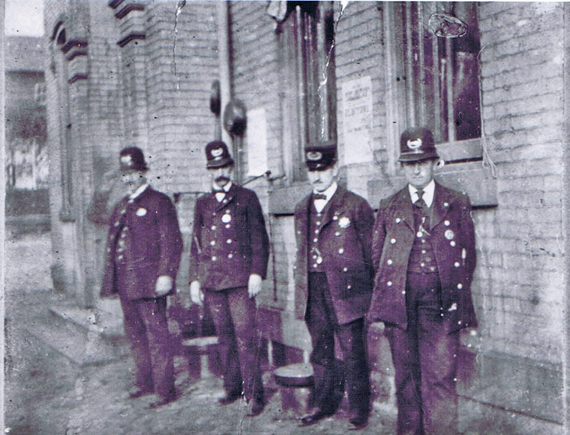 The four officers, held in the city jail overnight, wore their blue uniforms minus the badges . The March term of the Grand Jury in returned nine indictments against five officers and two special officers in connection with the enterings and thefts . Indicted were McBane, Cunningham, Hanna, Carroll and Stuttler along with Bishop and Jerry Raimond of Newell, special officers. McBane, who pleaded guilty to eight indictments, served as the state's prime witness in the trials. However, the Prosecution struggled in its efforts to convict. Hanna, first to go on trial, was acquitted in May of the thefts of coffee pots from the Smith & Phillips Co. store in 1954. A jury cleared Cunningham and Raimond in June 1959 of breaking into the Berman Lumber Co. in 1954. Raimond was convicted on three counts of receiving stolen goods -- movie cameras and projectors taken from the Burbick Hardware Co. store. Cunningham was subsequently convicted of attempting to bribe a prospective juror in one of his trials, and Carroll and Raimond were found guilty of entering the Burbick Hardware in 1952. Cunningham allegedly offered Donald Lockhart, a drug store clerk, the difference between the jury pay and what he earned as a clerk if Lockhart >were chosen for the jury. He was not selected. PUBLIC REACTION to the tolerance of gambling and conduct of the police officers brought a community demand for reform at City Hall. >The Grand Jury which indicted the burglary ring had also leveled severe criticism of the police department. The report found the force "inefficient," "untrained" and "incapable of law enforcement." Police Chief John Russell was seen as "wholly incapable of administering his duties. Two other officers were termed unfit for duty, and one, because of drunkeness and gambling, was dismissed from the force. In the 1958 elections, a reform slate headed by Fred P. Lawrence, a pottery executive, for Mayor was put in office. Chief Russell retired in May 1958, succeeded by Lt. Americo Radeschi, a Midland native who had been the first city officer to attend FBI School. Seeking to provide better administration and upgrade the police department, Lawrence brought in former Youngstown police official Daniel Maggianetti. Most of the men on the force resisted his strict discipline and enforcement methods, and the very conservative community did not welcorne an outsider to make changes from tradition. 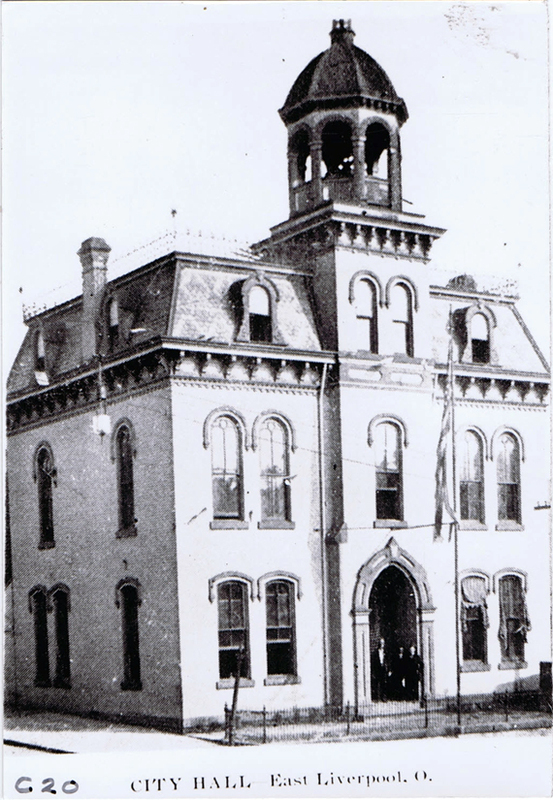 To ease the financial difficulties, Lawrence proposed and the new reform Council adopted the city,s first income tax. Opposition to the tax by labor groups and others along with reaction against Maggianetti defeated Lawrence in his re-election bid. But Lawrence, along with Maggianetti and Radeschi, had placed the police force on a more professional and respected basis. And labor leaders and citizens finally saw the need for the income tax, and voters eventually supported it in 1963. Under Radeschi, a detective bureau was established, the department, s first juvenile officer assigned, and the department linked to national and state crime reporting teletype systems. East Liverpool ... it was another busy day for the East Liverpool Police Department as they celebrated 100 years as a professional service. Chief of police Mike McVay had a cake ready for the event and discussed the departments founding on August 11, 1903.
" There was a big fight over the size of the department," said McVay." The mayor wanted eight men and city Council wanted seven." City Council eventually prevailed, overriding the mayor's veto. The department eventually grew to 31 men in the late 1960s, but started declining in numbers again in the late 1970s. "It was finances again," said McVay. "Most the guys returned and weren't replaced. There were some layoffs in the 80s." The force currently stands at 22 officers with two laid-off. There are five full-time and three part-time dispatchers. The longest-serving police officer is Capt. Norm Curtis, who joined the department in August 1974. McVay is six months behind him, having joined in February 1975. Locally, McVay said the oldest retired officers are Bill Tice Sr. and Tom Walker. "There could be older ones around the country I'm not aware of," said McVay, who declined to speculate on ages for his own safety, he added with a smile. Before the police department there was a town marshal. That Marshall was Charles Gill, who went on to become one of the original seven members of the East Liverpool Police Department. The detective bureau opened its door in the late 1960s, and still operates today. "The biggest changes over the years is technology." said McVay. Between computer and LEADS systems to gun technology, nothing has resisted the march of technology in this country. "Even the violence has changed,"said McVay. "It seems a lot worse now." Looking to the next 100 years and the declining population, McVay believes an alternative will be found on how to fund the department because "the crimes not going anywhere," [said] McVay. Some additional information and pictues. 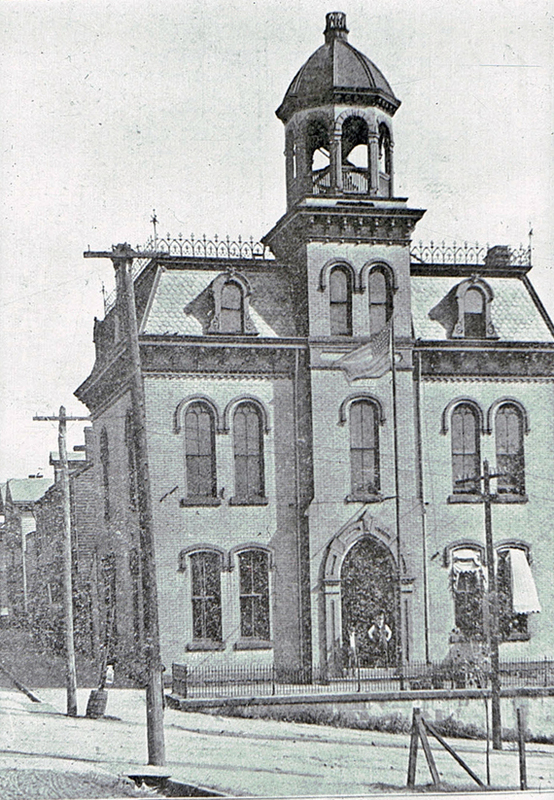 These pictures come from a photograph Album that belonged to the late Jack Lanam and was given to the East Liverpool Historical Society upon his death. In front of City Hall. Corner of 3rd and Market Streets. L to R: Henry Aufderhide, Mayor John Wyman, Huey McDermott. 1915.